Jack Kemp was one of the best people in modern American politics who never became President. I'll be even more blunt: when the 1996 elections came around, Kemp was the only reason why I not only voted for Bob Dole, but put up a huge campaign sign for "Dole-Kemp" in our front apartment window (yeah my roomie was rootin' for 'em too). And I can't help but wonder: if he had been vice-president under Reagan (I've heard plenty over the years that he was highly considered for the job by Reagan himself, but the party bigwigs wanted George Bush as his running mate instead) then this might have been a far different... and far better... country today. Kemp was a man of real ideas, particularly in regards to economic growth. 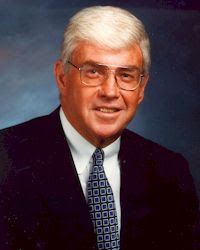 Jack Kemp - former NFL football player, member of the United States House of Representatives, and Secretary of Housing and Urban Development - passed away today at the age of 73 following a long battle with cancer. Our thoughts and prayers go out to his family tonight. Thank you for your comments on the passing of Jack Kemp. You've captured my thinking exactly. I have always thought the same thing about Kemp as VP under Reagan. He was one of the good ones and there's a special place in heaven for Jack Kemp.